1. 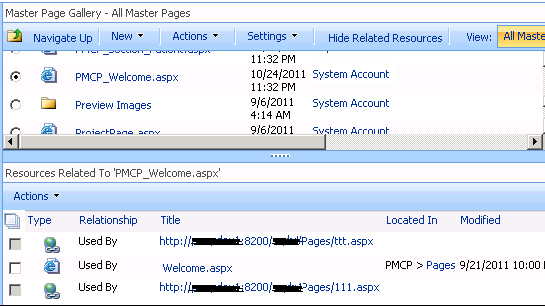 Get an inventory of all Page Layouts deployed across a SharePoint 2010 Farm. 2. To find out whether or not any of these Page Layouts were in use or not within its various sites/sub-sites. To simply put it the other way, did any of the sites/sub-sites had Pages created out of any of the available Page Layouts in the farm. The first requirement was not too hard to accomplish, we have the PublishingSite.GetPageLayouts in the SharePoint OM, but I had to scratch my head a little bit for the second one though. Iterating through Pages library within numerous site/sub-sites for approximately 20,000 site collections in the Farm, in order to find out the Page Layout usage would be too expensive and time consuming. There had to be a better/faster approach to handle this scenario. The OOTB Show Related Resources functionality allows a user to select any of the Page Layouts/resources within the Master Page and Page Layouts Gallery and mentions files that uses it across the site collection. Now there has to be a way to achieve the same programmatically as well. #I can make use of Export-CSV to generate a .csv file for reporting purposes. That works like a charm. ## Of course, I will wrap the above script in a foreach block to iterate through all web applications and site collections in the SP 2010 Farm. #Backward links contain the URLs of all files that link to the current file from the current site collection and its # sites/subsites. The above script is just a primer to the wide array of possibilities that PowerShell offers as a tool. This line returns an error that "Exception calling "GetPageLayouts" with "1" argument(s): "Object reference not set to an instance of an object." I am using sharepoint2010. and created a ps1 script for this code. ## - If the excludeObsolete parameter is set to false, then obsolete PageLayout objects are included in the collection.